When you want to create a truly striking display in the late-spring landscape but don't want to deal with coordinating bloom times and colors, consider choosing our new blend of blooms. 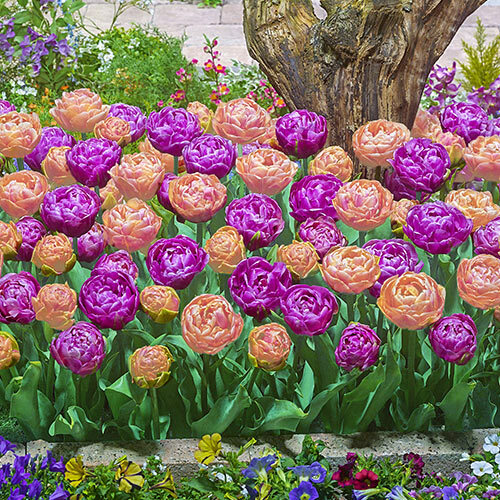 Spring Delight Tulip Mix is a fragrant combo of lush, fully double tulips in a duo of bold, bright hues. We've selected the sister varieties Copper Image, a rich copper-hued tulip, and Amazing Grace, bearing brilliant lavender-pink blooms that turn deep pink over time. Together, these two create a wonderful palette in the garden. The flowers are quite large at 4½-5" across and really stand out in the border, container or vase. 4.5 to 5" fully double flowers. It is important to let the foliage mature and die down naturally, do not cut back. Next year's bloom is being developed.